Two of the Best Breedings Out There!! All Chocolate litter due December 9th, 2018. 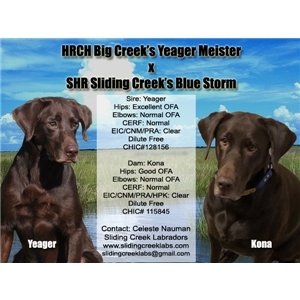 HRCH Big Creek's Yeager Meister x SHR Sliding Creeks Blue Storm Kona. 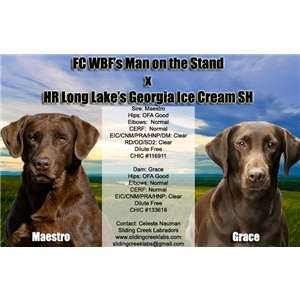 All Chocolate litter Due January 1st, 2019 FC WBF's Man on the Stand QA2 "Maestro" x HR Long Lake's Georgia Ice Cream SH "Grace". We strive to produce puppies that are healthy and genetically sound. Our goals include producing Labradors that are fearless, intelligent and loving, quick to learn, and able to excel in competitions such as Field Trials and Hunt Tests, be hunting companions and/or loving family pets. To aid in reaching these goals, we use the Avidog methods for breeding, puppy rearing, and puppy evaluation. These methods are state-of-the art and give our puppies the best possible start to their lives. We raise quality registered AKC and UKC Labrador Retrievers with strong pedigrees that include National Field Champions, Grand Hunting Retriever Champions and Hall of Fame dogs. Our puppies are our main focus for the first eight weeks of their lives. We give our puppies individual attention on a daily basis, from birth, and we give them socialization with a variety of people and with dogs. We start our puppies house-breaking, introduce basic obedience including recall to a whistle. We also introduce them to crates and car rides. We expose them to birds, shot guns, retrieving and with appropriate weather, we introduce them to the water too. During the period from three to sixteen days of age, our daily handling of our puppies includes Early Neurological Stimulation (ENS) and Early Scent Introduction (ESI). Early neurological stimulation has been shown to: improve cardiovascular performance, strengthen heartbeats, strengthen adrenal glands, increase stress tolerance, and increase resistance to disease. We strive to make the best possible matches between puppies and new homes. We want all of our puppies and their homes to thrive. We use the Avidog Puppy Evaluation Test (APET) to evaluate our puppies and to help us help owners develop smart training plans for their puppies first year. We treat our puppy homes like family and we are committed to our puppies and their homes. This is a long-term commitment. We expect to stay in touch with puppy owners for the life of their dog and beyond. Health screenings for our breeding stock include: OFA hip & elbow exams, EIC, CNM and PRA We also test to ensure that our Labradors do not carry any dilute color genes such as Silver. We whelp 100% dilute free Labrador puppies. While we strive to produce the most physically sound puppies possible, despite our best efforts, we acknowledge that dog breeders are creating living beings and there is no way to produce perfect dogs. As a breeder, we believe it is our duty to take responsibility for the dogs we produce. We do this by warranting our dogs against genetic defects, providing a 26 month Health Warranty. Visit our Web page www.slidingcreeklabs.com for more information and LIKE our Facebook Page, Sliding Creek Labradors, for tons of photos and daily updates on our litters.